We recently had the chance to review a fun new winter accessory...the Beard Head. "Beard Head knit beard caps combine the comfort and warmth of a traditional knit cap with the amazing styling of having a massive beard and moustache growing on your face! What person could pass up the incredible opportunity to sport his or her very own beard! We know we couldn't! Beard Head knit beard caps are one size fits (mostly) all, durable and machine washable! They are perfect for skiers, snowboarders, sports fans and people who enjoy all types outdoor activities! The unique design of the Beard Head allows your entire face to remain warm, even in the harshest weather. 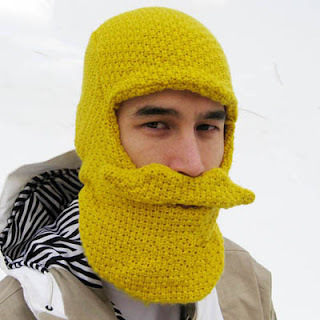 Your chin, cheeks and upper lips will thank you as the Beard Head keeps them toasty warm!" "The Viking Edition Beard Head is a magnificent choice for anyone looking to add some "mightyness" to their wardrobe! Some say the Viking Edition Beard Head may invoke the power of mighty Thor himself! Feel the Beard-y greatness of the mighty Thunder God as you don his awe-inspiring visage and delight in the face-pounding warmness it provides!" What we thought: We really had a lot of fun with our Beard Head:) It was really well-made and kept the face and head of whose ever turn it was to wear it nice and toasty warm. These are super cute novelties, but very functional as well. You can find lots of different designs at Beard Head for both men and women, adults and children. They have the classic Beard Head in several colors(including pink and coordinating colors for football fans!) and they have the Trojan-style Mohawk Helmet, which is adorable! They even have a Fu Manchu, a Mario and a Walrus mustache if you find those are more your style:) If you are looking to add a little comic relief to your winter wardrobe...check out Beard Heard and live vicariously! ABCD Diaries gives Beard Head an A+! Buy It: Find these fun head toppers at Beard Head! Win It: One ABCD Diaries reader will win a Beard Head of their own!! To enter, sign up to follow our blog via GFC and comment on your favorite Beard Head. Disclosure: ABCD Diaries was given a Beard Head for review purposes only. We were in no other way compensated. The opinions expressed in this post are ours and ours alone. I like the lumberjack beardhead. The Navy Blue-Grey Beard Head is my favorite. My fiance would love to have one of these! I follow you via Twitter as giveawaysetc. I'm following BeardHead on twitter as giveawaysetc. I entered your Baringo Messenger Bag giveaway. I love the child-size Spartan hat. My son would look so cute in it! I love the Viking Combo, I follow via GFC. I like the viking combo. Too cute. I entered your Mossy Bayou foods giveaway. These are too funny! I would like Navy Blue-Gray! follow publicly with gfc (pennywatcher). my favorite is the lumberjack. I follow GFC and like the viking one the best. I like the lumberjack beard head. I would love to win this for my rugged Honey/Hubby - the Lumberjack is my favorite. I am a GFC Follower (kellyr78) and my favorite Beardhead is the "Grandpa"- I'd love to give it to my dad!